Ripe for the “big brain meme”. There are cases of art in the world where you want to like them but you end up unable to. These are the cases that are perhaps most likely to break your heart, especially when it comes to artwork. It’s when you see a piece and you know what it’s trying to accomplish but it misses the mark by a lot and you’d rather it hadn’t have. Because there was some real need for that piece of art, for whatever reason. Maybe it really speaks to you or speaks to the larger struggles of the world right now. Maybe because it addresses something you’ve been thinking about or hoping people would be taking more seriously by now. Maybe it’s just an important topic that needs another perspective. Whatever the case, these are the works of art that let us down the most. More than the ones that were failures to begin with or never had anything important to say anyways. No, it’s the pieces of art that were clearly saying something, gave it an honest try and came up short of your expectations, despite what you wished had happened. 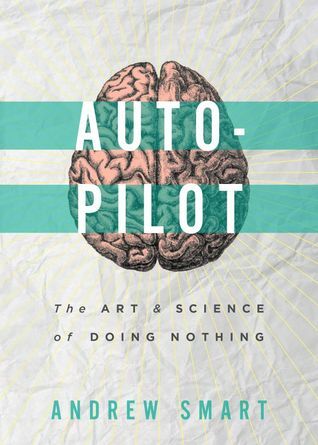 The book Autopilot: The Art and Science of Doing Nothing by Andrew Smart is a lot like that. It’s a book, perhaps more of an angry manifesto or long-form essay broken into many small parts, that comes up short from arguing what it tries to argue. It’s thesis is fairly simple and important: Laziness is an integral part of our lives and we should be indulging in it more often. We should, in fact be thinking about it less and less as something to “indulge” in but just something to enjoy. This is a fantastic thesis and one I heartily support. As the title of my website might suggest (just maybe!) I’m a big fan of laziness and taking it easy. I want people to take it easy more often than not and enjoy themselves. I want them to do it for themselves (and chiefly for themselves) and do so without the guilt. Get rid of those subjective notions of a “couch potato” and just enjoy the time you have for yourself. Whether it’s for self-care, simple relaxation or whatever else. But Smart doesn’t make a case for this as strongly as I’d hoped. His chapters are full of neuroscientific terms and sometimes (though not often enough) studies and statistics to back up a given claim. But they often feel apart from the title of his book and the arguments themselves (as one GoodReader reviewer said) are never”stitch[ed] together into a single coherent argument“. That said, some of Smart’s individual claims are interesting, plausible and even compelling in some cases. The idea that the brain is a place that’s unusually active even when it’s resting. The idea that brains do their work better when under their own pressures rather than external ones. The idea that the brain shouldn’t be controlled to make it work better. As an anarchist especially, some of these points feel plausible because it meshes quite nicely with my own political ideology. And also as a person who has worked in retail for over 5 years and seen what interference with workers does to their patterns of behavior (as well as my own) anecdotally speaking this all seems completely plausible to me. One of the major failings of this book is that it’s frustratingly repetitive. Smart will repeat his points about neuroscientific terms or about Six Stigma, but he won’t focus enough on the default network. Smart doesn’t repeat the points that really do bear repeating and instead regales us (or attempts to) with anecdotes about Sir Issac Newton and Rainer Maria Rilke. There are also gaps in this book with regards to its argumentation. Throughout Smart’s chapters I almost never felt like his arguments were well sources or cited. There were a few cases where this wasn’t the case (in particular, when he speaks about noise) but even in those cases, they seem, again, distant form the original topic. Perhaps most dissatisfying of all is the conclusion to this book. At less than 10 pages Smart suddenly goes from, “maybe laziness is a good idea!” to “work is destroying the planet, let’s abolish it!”. But as I said in the chapter review for the conclusion, this is a completely hasty (bordering on unprofessional) move by Smart. Look, there’s no one in the world that’s perhaps so convinced of Smart’s thesis both in the first few chapters or so (society underestimates the value of laziness) as well as the conclusion. But Smart doesn’t nearly give it the attention and space it deserves and really needs in order to be persuasive. It felt more like a shallow response to a New York Times article and something I might write on the site, as a blog post. But not as part of a book! The sections on Six Stigma and noise felt almost endless to me. It was mental grinding of a sort just to get past these chapters and back to something that felt even somewhat related to the original topic. And as much as I hate to say it, the Six Stigma sort of managing mostly seems like a personal issue Smart threw in. Not something that seemed necessary. Despite these criticisms I often found Smart’s writing engaging enough to keep reading. And there were interesting tidbits that, while not very relevant to the book’s title, were interesting enough on their own. The conclusion wasn’t strong but it was nice to see that Smart believes that, even if he didn’t give it the conceptual space it needed. Unfortunately, I would recommend borrowing this book, at best. Maybe read the first few chapters or so to get a feel for it and then keep reading if you really want. A lot of the concepts in the early goings are fascinating and promising but they never amount to much, sadly. Autopilot is a piece of art that invigorates almost as much as it disappoints. If you enjoyed this review, consider donating to my Patreon!